A beautiful meditation on the joys of being a grandparent and a practical guide to help you and your adult children make the most of your relationship with a grandchild. For many grandparents, a grandchild offers a second chance to become the parent they didn’t have the time or the energy to be when raising their own children. Being a grandparent, family relationships expert Jane Isay argues, is the opportunity to turn missed opportunities into delight. 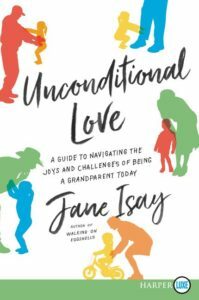 Drawing on her personal experience, dozens of interviews, and the latest findings in psychology, Isay shows how a grandparent can use his or her unique perspective and experience to create a deep and lasting bond that will echo throughout a grandchild’s life. She explores the realities of today’s multigenerational families, identifying problems and offering solutions to enhance love, trust, and understanding between grandparents, parents, and grandchildren. She also offers a wealth of practical advice, from when to get involved, when to stay away, and how to foster a strong relationship when you’re separated by long distance. Unconditional Love advocates for honest conversation, thinking in the long run and healing breaches in order to be together, understanding that most of us try to do our best and need to be forgiven if we fail. Isay argues that secrets and surprises may tilt the boat but won’t necessarily sink it and that grandparents and their grown children are happier when they give each other the benefit of the doubt. Most importantly, she writes, the advent of grandchildren offers families the opportunity for healing and redemption—if we seize the moment. In lovely prose and through delightful stories, Isay shows us how we can.